•	Synthesis of Carbon Nanostructures and its applications as hydrogen storage materials, catalysts, super-capacitors, composites, Bio sensors, NLO materials etc. •	Homogenous/Heterogeneous Catalysis: Alcohol oxidation, C-C coupling reactions. Catalytic activity of Fe(II) and Cu(II) PNP pincer complexes for Suzuki coupling reaction, App. Orgnometallic Chem. 32(2) 2018, e4054. 5. Lolakshi Mahesh Kumar, Badekai Ramachandra Bhat, Cobalt pincer complex catalyzed Suzuki-Miyaura cross coupling -A green approach, J.Org. Chem. 827, 2017, 41-48. 6. R. Prasad, V.Ganesh and B.R. Bhat, Nickel-oxide multiwall carbon-nanotube/reduced graphene oxide a ternary composite for enzyme-free glucose sensing, : RSC Adv., 6, 2016, 62491-62500. 8. Raghu Raman Rajagopal, L.S. Aravinda, Ravindra Rajarao, Badekai Ramachandra Bhat, Veena Sahajwalla (2016), Activated carbon derived from non-metallic printed circuit board waste for supercapacitor application, Electrochimica Acta, 211, 2016, 488-498. 9. Raghavendra Prasad, Lolakshi M.K., Badekai Ramachandra Bhat, rGO supported Co-Ni bimetallic magnetically separable nanocatalysts for the reduction of 4-Nitrophenol, Synthetic Metals, 219, 2016, 26–32. 10. Raghavendra Prasad and Badekai Ramachandra Bhat, Multi-wall carbon nanotube–NiO nanoparticle composite as enzyme-free electrochemical glucose sensor, Sensors and Actuators B: Chemical 220, 2015, 81-90. •	Commonwealth Academic Fellowship at Northumbria University, New Castle Upon Tyne, United Kingdom: January to April, 2015. •	Visiting Professor, SMaRT Center@ University of New South Wales, Sydney, Australia. •	Direct Synthesis of phenol from Benzene on iron impregnated Activated carbon catalysts. Appl. Catal. A, 2005,290,1-8. A Science Direct Top 25 Hottest article. •	Green Conversion of Alcohols to Carbonyls Catalyzed by Novel Ruthenium-Schiff base-triphenylphosphine complexes. Inorg. Chem. Comm., 2011,14, 155-158. Science Direct Top 10 (2nd) most cited article. November, 2010. •	Results of article published in J. Nanopart. Res., 14, 2012, 656-661, has been Published in Nanotechnology weekly on 19th March, 2012. •	J. Nanopart. Res., 14, 2012, 656-661, has been published even in Vertical news and High Beam research due to its simplicity, environmental friendly route to synthesize new worm shaped carbon nanofibers. Prof. VeenaSahjawalla, Director SMaRT Center @UNSW, Sydney Australia. Dr. MainkMajumder, Nanoscale and Engineering Lab, Monash University Australia. Dr. FawadInam, Northumbria University, United Kingdom. Dr. T.H.Kim, Center for energy storage, KIER, Republic of South Korea. 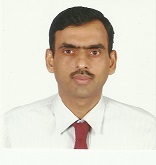 •	Member, Board of Governors, NITK, October, 2014 to till date. •	Secretary, Faculty Association of NITK, 2013 to 2014. •	Head, Department of Chemistry, NITK, 11th August, 2014 to till date. •	Associate NCC officer (Rank: 2 Lieutenant): 4/19 Kar. Bn: 1995-1998. •	Associate NCC Officer (Rank: Lieutenant): 2 Kar. Eng Comp. : 2000-2007.